At the Holiday Inn Resort, Regent Beach active holidays and tranquil unwinding live happily together. Those in search of the latter will definitely enjoy the Tea Tree Spa where you can be pampered in the indoor treatment room, or down by the shore in classically Thai-designed wooden pavillions. Massages are rich and varied, plus detoxifying body and facial treatments using premium Ytsara Spa products made from organic and wild tropical floral, herbal and fruit extracts. Four VIP rooms, massage treatments for couples, private Thai massage, steam rooms and outdoor Jacuzzis are just some of the other routes to body bliss and total relaxation. For something more active, the recently renovated Health and Fitness centre awaits, with all the right equipment, as well as regular exercise classes. 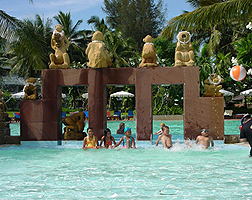 There are also two swimming pools, plus another two for the kids to have fun in. Other activities that you can get involved in are tennis on four courts, table tennis, mini golf, petanque, snooker, cycling, beach volleyball, and if you want to exercise the mind, chess battles on a giant board. The kids will love the special Kids’ Club with its playground, fun games and activities, open from 9 in the morning till 6 in the evening. As a special treat, the hotel’s mascot will appear for pictures with the youngsters every Sunday. Babysitting is also available for parents who want some time to do their own thing. Incidentally, kids under 12 eat for free. For a very romantic tropical wedding or engagement, there’s a team of professionals to make it just the way you dream it. A range of options include a traditional Thai blessing or a Chinese tea pouring ceremony. Choose a setting indoors or out: in a beautiful garden, on a pristine sandy beach, by the pool or in a grand ballroom. With the largest meeting facilities in the area, this is a good place to do business too, on every scale from the intimate to the 2000-strong. A 24-hour business centre provides all the back-up you might need, including PCs and internet access, copying and fax, as well as private limo hire. Accommodation at the Holiday inn Resort, Regent Beach consists of ten different room configurations, and suites, in two wings. Next to the beachfront are the 33 villas. Wherever you stay, you’ll be able to access a 24-hour concierge service, 24-hour room service, a mini-mart, car park and high-speed internet access.